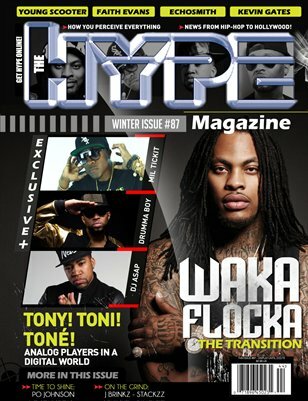 The Hype Magazine announced today that BSM's Waka Flocka will cover its Winter Issue #87 which hits stores December 6, 2014 and digitally November 26th, 2014. In the cover story interview, Waka talks his transition into the EDM world and the possibility of a double album release. Waka also discusses his newest artist Chaz Gotti and Joey Fatts and what they bring to the table. Joining Waka on the cover, The Hype Magazine chose what it considers at the "Three Horseman"; Drumma Boy Fresh whose production skills and lyrics are pushing his career to new and exciting heights, including a luxury adult beverage brand; Mil Tickit, CEO of three-time Grammy Award winning production team, Track Kingz who has stepped out of the production lab as an artist with his LP "Street Money"; and BET 106 & Park's DJ ASAP, a rising star DJ from Dallas who's been appearing just about everywhere music is played!! !